A Chinese envoy said Saturday that China opposes foreign interference in Venezuela's affairs while speaking at a United Nations Security Council emergency meeting on the situation in Venezuela. 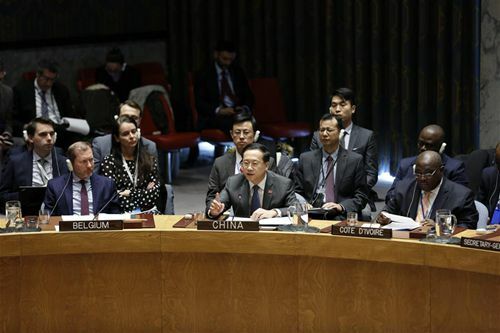 "China always opposes interference in other countries' internal affairs and opposes foreign interference in Venezuela's affairs," said Ma Zhaoxu, China's permanent representative to the United Nations. Noting that "the situation in Venezuela belongs to the domestic affairs of that country," Ma said it "does not constitute a threat to international peace and security and it is not on the agenda of the Security Council." "China is against adding the situation in Venezuela to the agenda of the Security Council," the envoy stressed, adding that the Venezuela's affairs "must be and can only be chosen and decided" by the Venezuelan people themselves. "We call upon all relevant parties to respect the choice of the Venezuelan people," he said. Noting that "maintaining stability and development in Venezuela serves the interests of all relevant parties," Ma said that "we hope all parties can contribute more to Venezuela's stability." "We hope that the international community can jointly create favorable conditions for that," he said. The Chinese ambassador told the Security Council that China has been "following closely the current situation in Venezuela" and calls upon all relevant parties in Venezuela "to stay rational, keep calm, and bear in mind the fundamental interests of the country and its people to seek a political solution to the issues through peaceful dialogue within the framework of the Venezuelan Constitution." "China supports the efforts made by the Venezuelan government to uphold national sovereignty, independence and stability," he said. "China maintains that all countries should abide by the purposes and principles of the UN Charter, especially the norms governing international relations and the principles of international law such as no interference in each other's internal affairs, mutual respect for sovereignty and territorial integrity and refrain from threatening to use force," Ma said. UN Under-Secretary-General for Political and Peacebuilding Affairs Rosemary DiCarlo briefed the meeting. The last time the Security Council convened on a weekend was on April 14, 2018, to discuss the Israel-Palestine issue. Saturday's meeting was requested by the United States and some other countries. U.S. Secretary of State Mike Pompeo participated in and briefed the meeting.